China’s actions have seriously violated Vietnam’s sovereignty. Vietnam on Monday denounced China for holding a legislative election in the so-called Sansha city in the South China Sea and conducting patrols in the Paracel island chain. 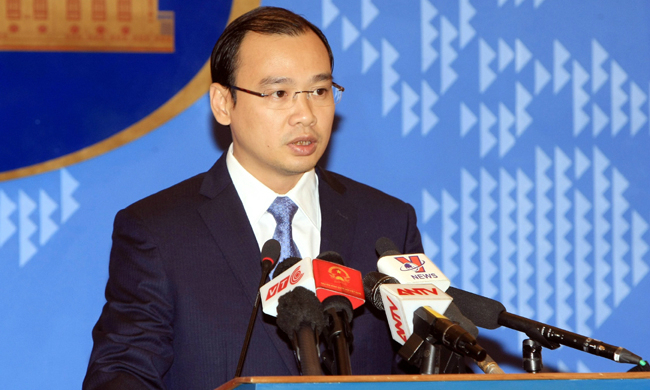 China’s actions have seriously violated Vietnam’s sovereignty over the East Sea, Foreign Ministry spokesperson Le Hai Binh said in a statement on Monday, using the official Vietnamese name for the South China Sea. Chinese media last month reported that the country had held an election for the 2nd Municipal People’s Congress of the so-called Sansha city and conducted patrols in the waters off the Paracels, which Vietnam calls Hoang Sa. Sansha, a prefecture-level city of Hainan Province, was established by China in 2012 to administer Hoang Sa and Truong Sa (Spratly Islands). The move has repeatedly triggered strong opposition from Vietnam. “Vietnam resolutely protests and asks that China respect Vietnam’s sovereignty, immediately putting an end to the above-mentioned illegal activities,” Binh said. China’s actions could not change the fact that Vietnam has indisputable sovereignty over the Paracels and Spratlys, Binh said, adding that Vietnam has full legal foundations and historical evidence to affirm its sovereignty over the two archipelagoes. In 1974, taking advantage of the withdrawal of the American troops from the Vietnam War, China invaded the Paracel Islands. A brief but bloody naval battle with the forces of the then U.S.-backed Republic of Vietnam ensued. Vietnam's behemoth northern neighbor has illegally occupied the islands ever since. But a post-1975 united Vietnam has never relinquished its ownership of the Paracel Islands. The Spratly island chain is claimed in part or whole by China, Vietnam, the Philippines, Malaysia, Brunei and Taiwan.